Two ingredients – bacon and light brown sugar. Two words – absolutely, and without a doubt, delicious. Last weekend I made two appetizers and two desserts for our neighborhood progressive dinner. Appetizer number two was medjool dates stuffed with homemade herbed cheese. Fruit and nut chocolate bars made it to the dessert table, as did green tea chocolate almonds. The progressive dinner was chaired by the very best neighbor in the universe, Mrs. Next Door. Besides being a stellar cook who feeds me delicious bits from her kitchen, she is also my occasional hand model for food photos (my own mitts are rather roughened from cooking chores). By her report, the caramelized bacon was devoured by partygoers, and I have been asked to provide the recipe. Here ’tis, in a little bit. It helps to use thickly cut bacon, and it is best all round if you use bacon from naturally raised pigs who root contentedly through pasture and woods. Harmony Hill’s thick sliced uncured smoked bacon is fragrant in the uncooked state, meaty and beautifully marbleized with creamy fat and prepared without nitrates. Just down the road in Glen Allen, Virginia lies the aptly named Harmony Hill Farm. Please do follow this link to their website and review their farming principles. Admiration for folks who live close to the land, and are good stewards of their land, leads to patriotic pride in young farming families whose methods harken back to days when Americans had greater confidence in the integrity of their food. At Harmony Hill Farm, beef is grass fed, pigs roam free and all poultry is raised in pasture the way nature intended. Harmony Hill’s perfect eggs were pictured in last week’s post “Small Steps to Eating Well”. A field trip to the farm is on my agenda. Caramelizing the bacon with brown sugar is like gilding the lily, but you do transform homey breakfast meat to highfalutin’ cocktail fare. As Jess Goldberg of Little House Green Grocery said of the sample I provided, “It’s like breakfast in one bite – the pancakes, the bacon and the syrup”. Mornings, evenings, midnight snacks, cocktail bites – really, any excuse to enjoy this dish. David Lebovitz has inspired me to try bits of this bacon candy in my next batch of homemade ice cream. Recipes and techniques for “candied bacon” abound on the internet, and my technique is simply a variation of these offerings. In place of a standard recipe, I offer my tips for success and allow you to dictate amounts. I cannot thoughtfully offer storage directions since my testing attempts have all resulted in complete consumption of the test product. For testing purposes, of course. 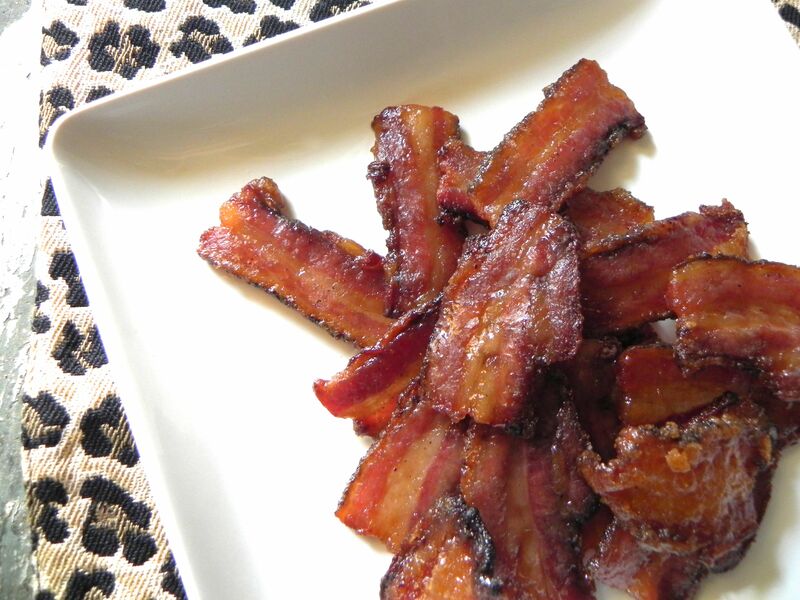 This entry was posted in appetizers, breakfast recipes, gluten free and tagged bacon appetizers, bacon recipes, candied bacon, caramelized bacon, pastured pork bacon on April 19, 2013 by Michele Humlan. Absolutely delicious and done in less than 20 minutes (I think my oven is right on the mark). Disappeared at lightning speed, beautiful, shiny, and caramelized. And I am certain your house smells great. Thanks, Paula!